Water. It's a topic of no small importance to tea drinkers and one that that's come up several times before here at TGS. Back in September I wrote about water harvested from icebergs, bottled and sold by Canada's Original Iceberg Water Corporation, who also make vodka using iceberg water. Then there was this overview type piece on bottled water and mineral water from October. And most recently a piece on H2Om Water, "the world's first vibrationally charged, interactive, bottled water". 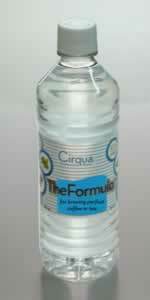 So as we bubble on along here I thought it was as good a time as any to make mention of Cirqua Customized Water. Cirqua is a company that apparently makes filtration systems for coffee and tea houses. They also offer The Formula, a brand of bottled water that's supposed to be formulated to make a better cup of coffee or tea. Whether or not it's really the perfect water, well, I'll leave that to you to decide. Here's their site.